With state-of-the-art technology such as three powerful new engines, the seven-speed automatic transmission 7G-TRONIC fitted as standard, the now even more effective four-wheel drive system 4-ETS, AIRMATIC air suspension and the anticipatory occupant protection system PRE-SAFE, the 2nd-generation Mercedes-Benz M-Class sets to reaffirm the Off-Roader’s leading position in a fast-growing market segment which Mercedes-Benz created with the preceding model in 1997. A new V6 diesel engine, available with two different outputs, is celebrating its premiere. It features third-generation common-rail direct injection and the latest in piezo injectors. The unit in the ML 320 CDI delivers 224 hp and places a maximum torque of 386 lb-ft on tap from 1600 rpm. Also on hand to offer the twin benefits of six-cylinder comfort and dynamism is the new ML 280 CDI, serving up 190 hp and a peak torque of 333 lb-ft. Another new arrival is the V6 petrol unit powering the ML 350, with 272 hp and a maximum torque of 265 lb-ft. 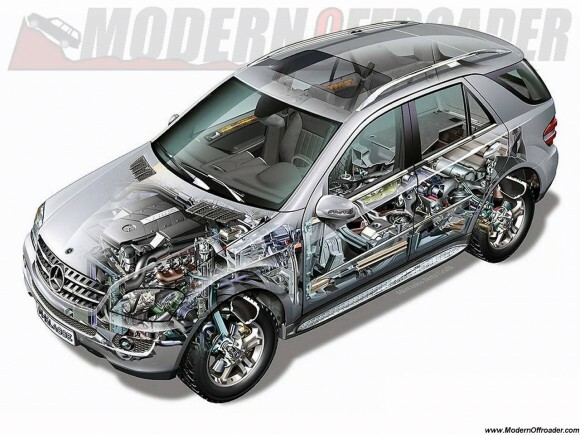 The engine range is headed by the eight-cylinder unit in the ML 500, which now has an output of 306 hp. The unique seven-speed automatic transmission 7G-TRONIC is fitted as standard in all variants of the new M-Class. Intelligent shift management allows the transmission to make optimum use of the engine’s enviable reserves of power, while making a major contribution to fuel economy. 7G-TRONIC can now be operated electronically using a gearshift lever positioned close to the steering wheel, a new system which Mercedes-Benz calls DIRECT SELECT. Additional steering- wheel gearshift buttons enable the driver to glide manually through the seven gears. Mercedes-Benz has taken the permanent four-wheel drive and 4ETS traction systems to the next level by incorporating additional functions such as Downhill Speed Regulation, Start-Off Assist and the ff-road ABS system. The M-Class can be ordered with two different variants of the four-wheel drive system, allowing it to meet the varying requirements of off-road drivers: in addition to the basic version, the new Off-Road Pro engineering package is optionally available; it enables the M-Class to master even the toughest routes across rough terrain. Its primary features include a two-speed transfer case with an off-road ratio, manually or automatically selectable differential locks (100 percent) between the front and rear axle and on the rear axle, and a modified version of the AIRMATIC air suspension system tailored to off-road driving, which can raise the ground clearance and the vehicle’s fording depth. The air suspension also significantly improves ride comfort, which is why Mercedes-Benz offers a road-going version of this technology as an option. AIRMATIC teams up as standard with the Adaptive Damping System (ADS), which adjusts shock absorber response to suit the current driving situation. All this accelerates the M-Class into a new dimension in driving dynamics and ride comfort. Mercedes engineers have also redeveloped the front and rear suspension of the M-Class: the double-wishbone front suspension makes a significant contribution to reduced road roar and tire vibration, ensuring impressive driving dynamics with its raised aluminum wishbones. The new rear axle has a four-link suspension system. Standard-fitted light-alloy wheels and wide 235/65 R 17 (V6 models) or 255/55 R 18 (V8 model) tires emphasise the sporting pedigree of the new M-Class. The latest production processes and the intelligent use of materials have made progress possible with respect to lightweight construction, tolerances and ease of repair. While conventional steel continues to predominate in the material mix for the new M-Class, Mercedes-Benz has made a five-fold increase in the proportion of high-strength alloys, which offer maximum strength for the minimum panel thickness and weight. The Mercedes-Benz M-Class also sets the pace for other off-roaders in terms of safety. Its occupant protection system is underpinned by a self-supporting body structure with large deformation zones in the front and rear ends, and a wealth of state-of-the-art technology from the luxury class as standard. This includes adaptive, two-stage airbags for the driver and front passenger, front sidebags and windowbags, as well as belt tensioners and belt force limiters for all seats. In the event of a rear-end collision, the newly developed NECK-PRO crash-responsive head restraints (optional) provide additional protection for the driver and front passenger. With the option of adding the anticipatory occupant protection system PRE-SAFE to the mix, the new Mercedes Off-Roader raises the bar in its class. This multi-award-winning technology provides a reflex response to critical driving situations where an accident threatens to occur, preparing the car and its occupants for an impending collision. PRE-SAFE acts in advance to pull the driver and front passenger seat belts taut, bring the fore/aft setting and the cushion and backrest angle of the electrically adjustable front passenger seat (optional) into a more favourable position and close the sunroof (optional) if there is a risk of the vehicle rolling over.